Men, of course, can experience a variety of emotions during this time but it’s brushed under the rug. The focus is usually on the woman. Rose’s research includes giving men an outlet, working with them and focusing on the man’s experience. They need grief counseling, social support and other like resources just like women. One of the simplest, easiest ways to show support to men is to simply ask how they in particular are doing. It’s okay to ask about the wife/partner, too, but a little focus on them is critical. 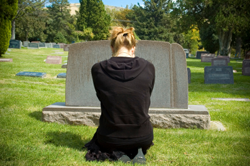 How they find meaning from a miscarriage loss is a topic that’s rarely discussed. Rose hopes to change that by focusing on the male partner in a miscarriage partnership. However, many people don’t know how to support the men in their lives who’ve suffered a miscarriage, and even more assume that it’s not as traumatizing for them. The loss of a child, whether born or not, can be devastating for both parents. It’s natural to want to comfort the mother, but in the process the male partner can feel left behind. They also may feel like they need to “be strong” for their female partner. Rose is challenging that perception and tendency in her doctoral studies.